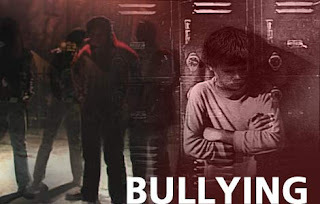 According to a doctoral research carried in the towns of Oporto, Braga and Grenade, which inquired 1237 11-16 years old, the phenomenon of bullying is being more and more accepted. It seems it's becoming banal. 84,5% of these youngsters have witnessed acts of violence among colleagues. What's more, the victims of bullying are referred to as "passive, socially incompetent, anxious, depressive and insecure". The aggressors are seen as "strong, extroverted, trustful, leaders". These are sad times. We have to raise our children to be more respectful towards the other - this basic civilized notion has been more and more forgotten during the last decades. Would we really like to go back to Neardenthal habits? I guess it was like that.